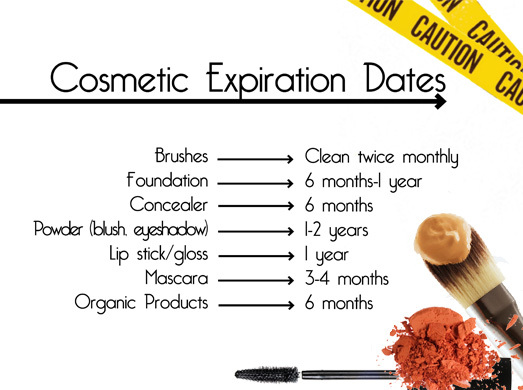 When purchasing your mineral makeup you may have been advised these products have no expiration date, or have indefinite shelf life. As a rule in regard to mineral makeup products, this is true to a point. Many individual ingredients possess an indefinite time line for expiration due to their composition which is what promotes their stability. Dry, raw ingredients when stored properly by the manufacturer maintain freshness levels beyond what a consumer would experience with the finished makeup product. For instance, our ingredients are stored in airtight containers which are then stored in 'no light' and 'no humidity' conditions. Moisture, air and light are what create the deteriorating process for mineral makeup products. Plus the way a raw ingredient is utilized also creates a shorter shelf life. Liquid makeup products for instance, have a greatly reduced shelf life since the dry ingredient will go through a chemical reaction process once added to a liquid cosmetic formula. This includes skincare products as well. The graphic to the right is only an example and is dependent on the type of formulas and how they are used. In fact, on all of our ONATI Skin Care products, Lip Colors, Mineral Makeup Products and MASCARA we incorporate the PAO (period after opening) symbol on our labels due to their composition. This informs the customer of the safety timeline and best efficacy and potency of our skincare and lip products after they crack the lid. Once opened, this symbol indicates when we recommend the emulsion or formula should be used by in order to preserve overall skin health. Some of you may have already seen this symbol, or weren't sure what it meant, but it is the indicator you want to see on any beauty product to be assured from the date of purchase which you should mark on the jar somewhere, to when opened, to when used by. We have incorporated this same symbol on all of our mineral makeup products with our new packaging, advising our customers of the recommended 12M (12 months) after opening for superior results providing the ultimate in color and freshness. However, you could extend our eye colors to 24M due to being highly pigmented if they are kept in a dark spot, and using the clean application with every use. Monitoring timelines is the best investment in keeping skin looking great and knowing when it is time to toss it. As a Mineral Makeup Look: If you are using your mineral makeup just for concealing imperfections or to simply enhance your complexion, then you may be able to enjoy the product for quite a long time, depending on the brand. Deterioration as mentioned earlier is caused by light, air and humidity, so you may even see a loss in pigmentation of your minerals when looking at them in the jar. However, once they meld with your moisturizer or you apply with the moist method, you can see a slight increase in the pigment that is lost in the jar, restore on the skin. Yet, the finished look still will not be as rich as when the minerals were new. As a Mineral Makeup Sunscreen: If you're looking to use your mineral makeup products as an added sunscreen since we know that zinc oxide and titanium dioxide are FDA approved as sun blocking agents, then expiration dates do matter. All OTC sunscreen manufacturers and dermatologists recommend purchasing new sunscreen every year. Even if you have unused portions, they are deemed to lose their effectiveness (potency) after a year. Mineral makeup is no different in this context. Repeated opening and closing of the minerals eventually degrades the mineral ingredient portion. Storage, such as on the counter, in your purse, or in your bathroom are all contributing factors for accelerating the process. Assess what and how you use your mineral makeup and then decide what is best for your skin. If a jar remains unopened, since many of our customers stock up on their foundations for instance, indefinite shelf life holds true. However, we do recommend discarding your mineral makeup foundation after it has been opened for at least a year. And don't just do it based on the mineral content of your makeup foundation whether you use it as a supplement to your sunscreen or not, but also to enjoy the richer pigments and botanical ingredients we utilize in our formulas for the best skin conditioning makeup finish.